You turn to your ingredient solution partner for safe, quality and economical solutions to your formulation or reformulation challenges. Nearly all ingredient suppliers can check those boxes, so how do you choose the right one to work with? Pay attention to what suppliers offer their customers. If they don’t go beyond the basics, there may be cause for concern. A supplier interested in truly partnering with you provides opportunities for you to leverage their knowledge, experience and passion when formulating products that will delight customers and differentiate your brand from the competition. Does the depth of experience and certifications possessed by the ingredient supplier team coincide with your needs? Do the ingredient supplier’s solutions balance formulation needs, trends, innovations, cost and special ingredient transparency considerations? Has the ingredient supplier earned a reputation for excellent customer service? Do they offer advanced technical, technological and testing capabilities and support? 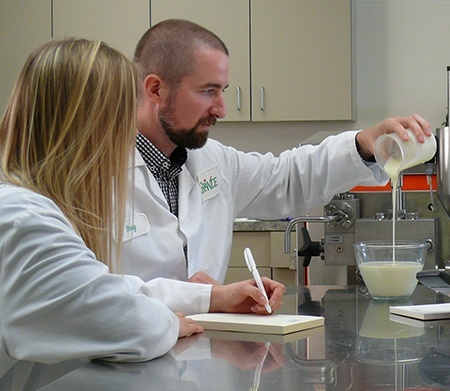 Not only can you confidently answer “yes” to these questions when evaluating Grande Custom Ingredients Group as a potential partner, you’ll also gain a team of experts who are fully committed to teamwork. Our technical sales managers say it best. "If we come across a customer with a specific application that may be a little bit out of what our immediate team is used to, and that we know another technical sales manager has experience in, we will collaborate with that technical sales manager as well to help solve that customer’s problem. You don’t just get one of our technical sales managers or just the application team. You truly get the whole team of Grande working on your product. Everyone is part of the team." Choosing a reputable ingredient supplier is imperative for ensuring food safety, quality and adherence to best practices. However, not every supplier provides the intangible value-add of dedicating their entire knowledgeable team to your success. Only true ingredient supplier partners will go the extra mile—like addressing the formulation benefits and challenges your R&D team encounters when they incorporate the top food trends we explore in our latest infographic. Click the button below to learn more.